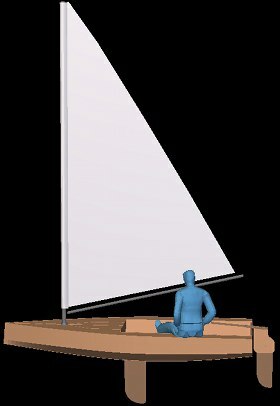 - LOA 8' x Beam 4' 1/2"
Full plans in PDF with 3D building guide. 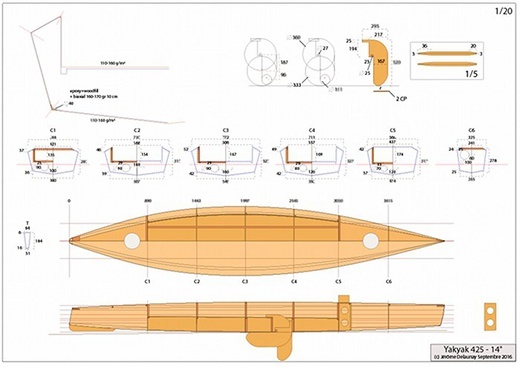 5 1/2 sheets of ACX 1/4 - 6 mm plywood. 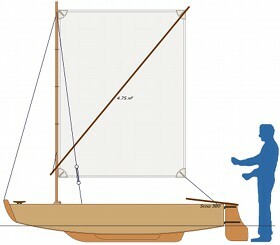 A simple sprit sail scow, which can be set as a tent at night on hoops frames. 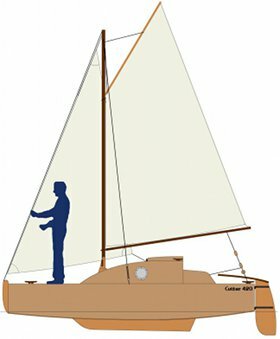 One main central long keel and two bilge skegs to sit upright. 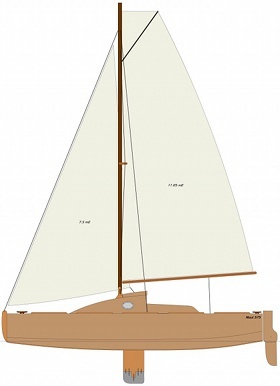 3-1/2 sheets of ACX 5/16 8 mm or 3/8 10 mm plywood. 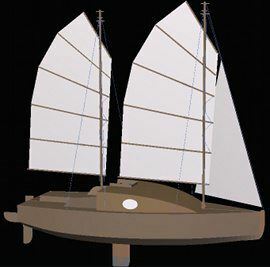 A simple junk sail minimalist scow. 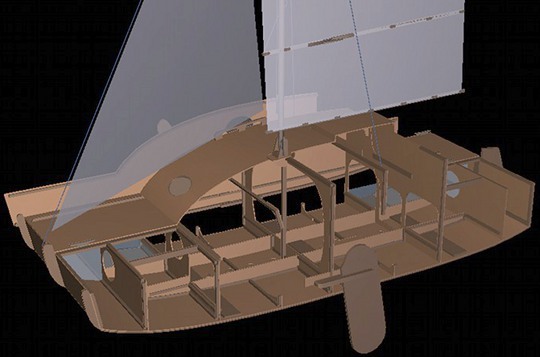 Feature my hinged battens details ! 7 sheets of ACX 3/8 10 mm plywood. 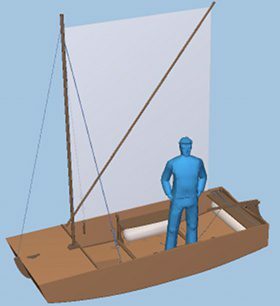 A junk sail scow pocket cruiser with a cockpit and a cabin with two bunks. 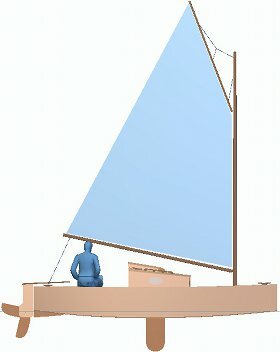 Full plans in PDF with 3D building guide and photos. 11 sheets of ACX 3/8 10 mm plywood. 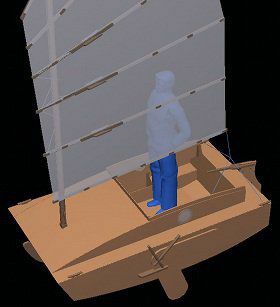 A junk sail scow pocket cruiser with a cabin with four bunks. More pictures. 14 sheets of ACX 3/8 10 mm plywood. 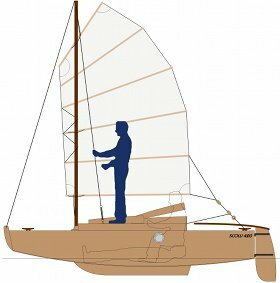 8 sheets of ACX 3/8 10 mm plywood. 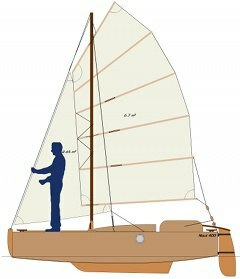 The classic pocket cruiser concept with my junk sailrig. A cabin with two bunks, and place for all your stuff, camping stove & toilet. Two plans in one ! 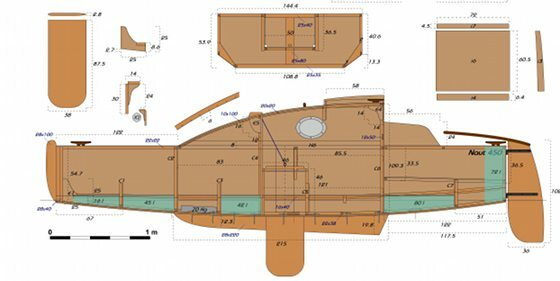 One double berth, a single bunk, galley and toilet locker. 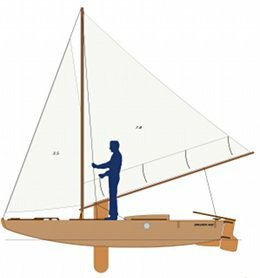 Classic lumber stringers or stich & glue epoxy assembly method. 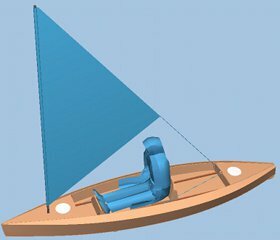 Stich & glue epoxy assembly method. 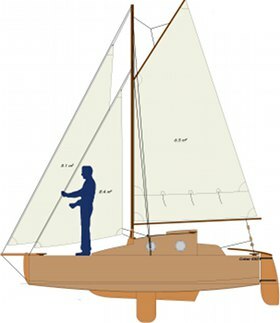 Plans with variations : ketch, schooner or sloop, two roof shapes, long or short cockpit. 20 sheets of ACX 3/8 10 mm plywood. 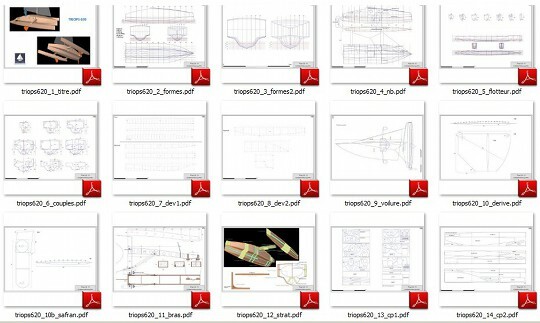 et 4 sheets of ACX 1/2 12 mm plywood. 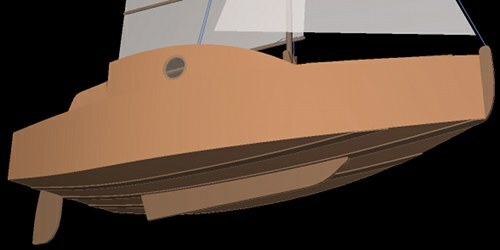 Fiber glass / epoxy on the bottom of the hull. A cabin with a double bunks, and place for all your stuff, camping. 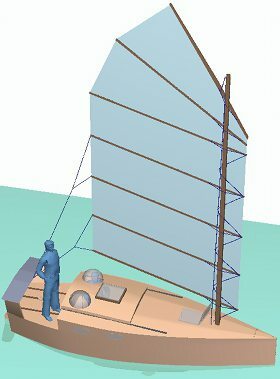 - SA 9.9 m² - bermudian or gaff rig. 10 sheets of ACX 3/8 10 mm plywood. 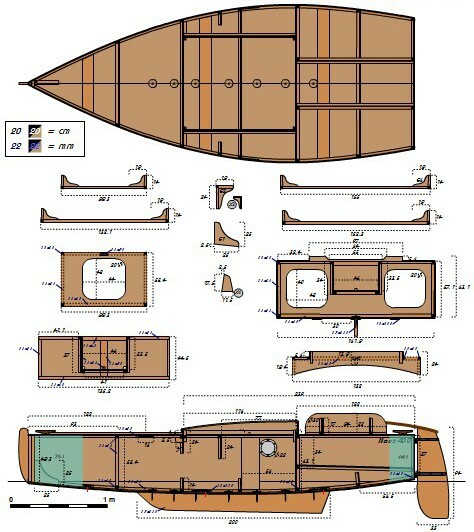 et 1 sheets of ACX 1/4 6 mm plywood. A sharpie with multiple roots. 14 sheets of ACX 9 mm plywood. 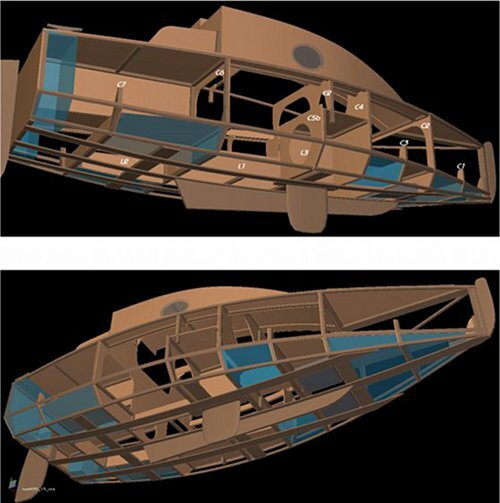 et 3 sheets of 12 mm plywood. 17 sheets of ACX 6 mm plywood. 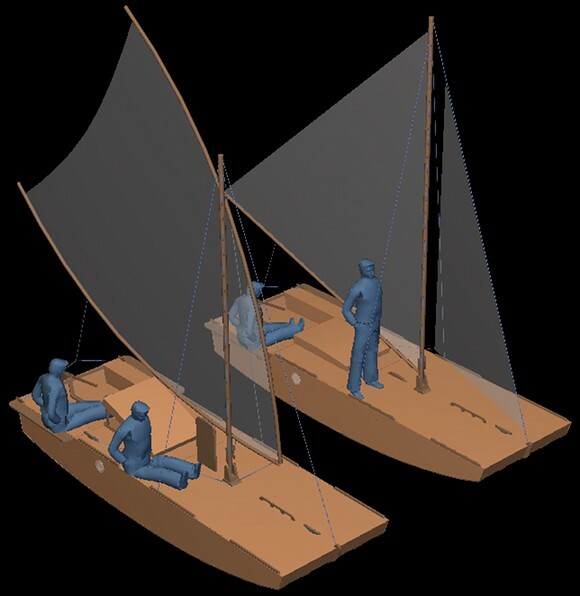 Jangadas are traditional fishing boat on the north coast of Brazil, originally simple log rafts. 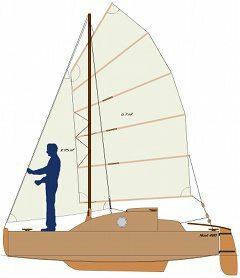 The Jangada 488 is a special surf scow, with the choice of a Bermudian or a crab claw rig, barn door or lifting rudder, and optional seating wings. 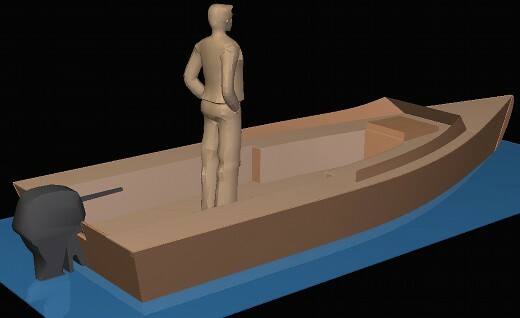 There is enough space to sleep on board. 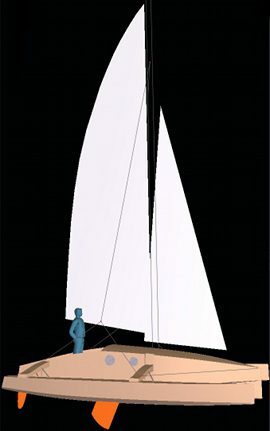 8 to 12 sheets of ACX 3/8 10 mm plywood. 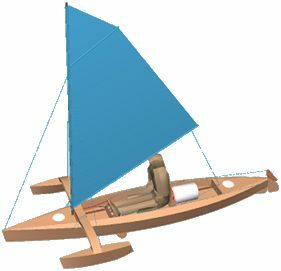 A classical motor launch on a simple semi-dory hull. 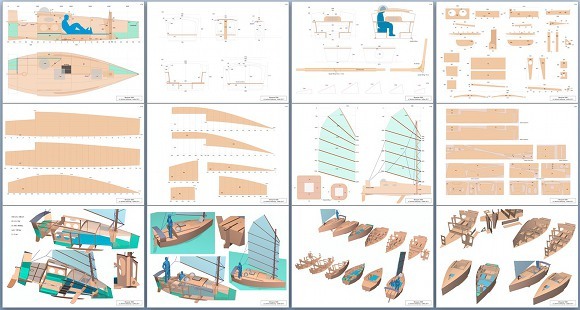 9 sheets of ACX 3/8 10 mm plywood and 4 sheets of ACX 1/2 12 mm plywood. 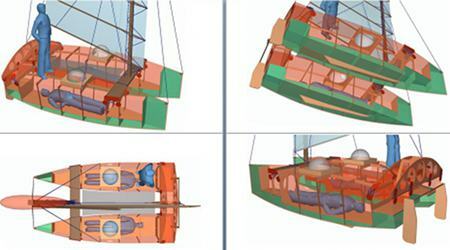 On the same basis, a motor launch with a shelter cabin. 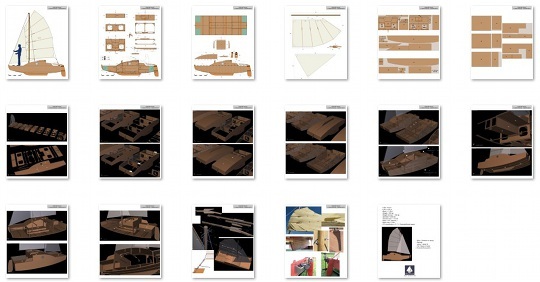 10 sheets of ACX 3/8 10 mm plywood and 4 sheets of ACX 1/2 12 mm plywood. 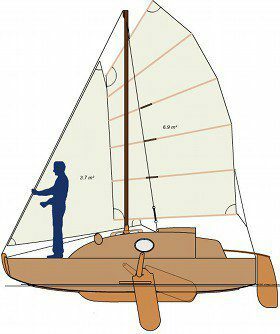 A contemporary fast sailing dinghy. 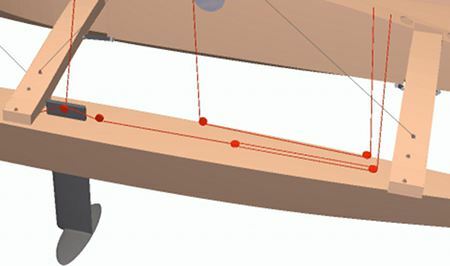 The hull shape has been tested in a VPP program. 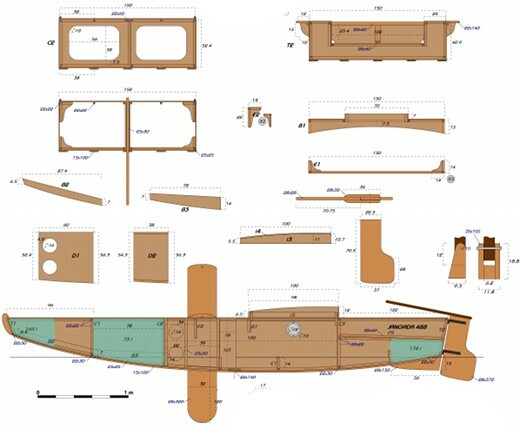 6 sheets of ACX 1/5 5 mm plywood. 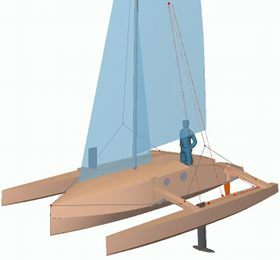 A folding trimaran for advanced builder. 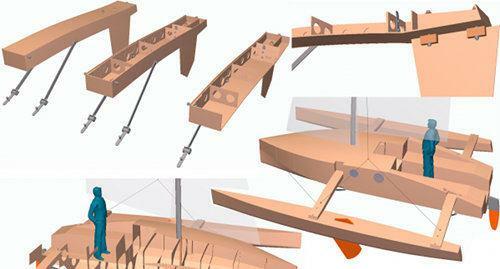 - LOA 6.2 m x max beam 4.95 m, 2.1 m fold, 1.85 m unbolt. 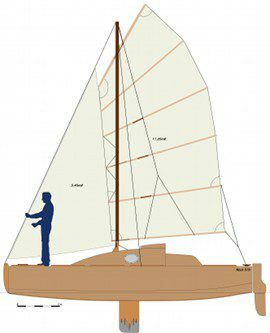 - SA 23 m2, can use a Tornado ou Hobie Cat 21 rig and sails. 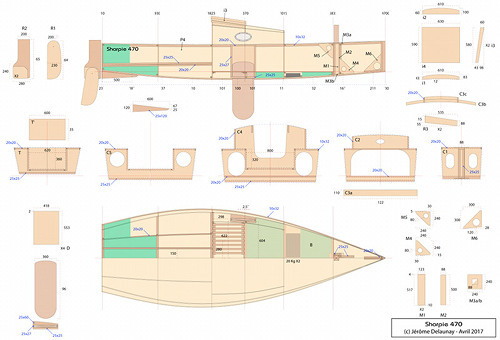 PDF A3 plans of the main hull and floats, bulkheads, rudder, leeboards, folding beam, glassfibering with UD or carbon. 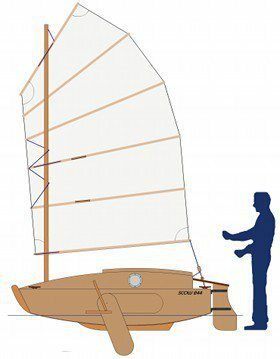 26 to 28 sheets of ACX 7/16 6 mm plywood. 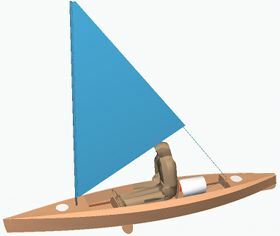 A Sit On Top kayak with a leeboard and sailing option. 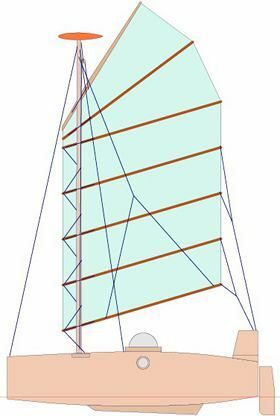 Plywood epoxy building on a central backbone and light frames. - SA 1.56 / 1.82m2. 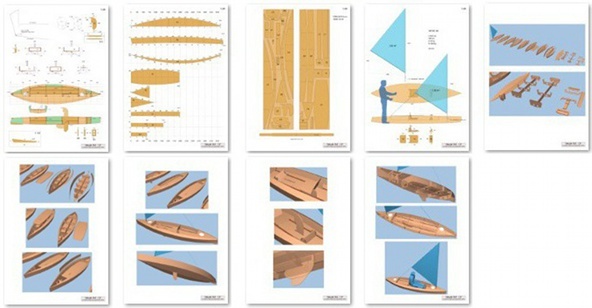 4 sheets of ACX 1/5 5 mm plywood. - SA 1.82 / 2.2m2. 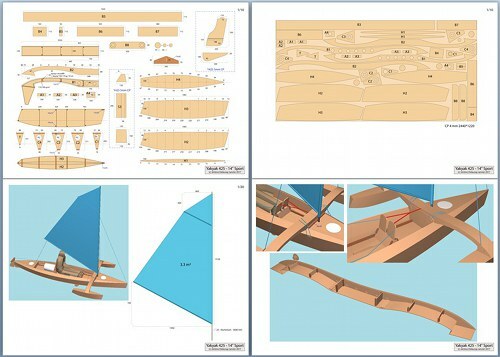 1sheets of ACX 1/6 4 mm plywood.